BATI Group is well organised and experienced in handling and transporting large projects. As outlined in a previous article (read here), they were selected for the prestigious TANAP (Trans Anatolian Natural Gas Pipeline) Project. The project is very challenging due to the many issues which must be taken into consideration. One of the many challenges successfully faced by BATI included the pictured ship-to-ship operation. 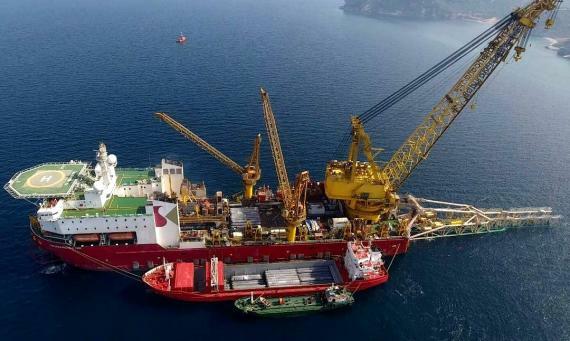 Mr. Oguz Cankur of the Project Operation department comments; "A project of this scale demands vast experience in both sea and land operations and strong coordination in obtaining bureaucratic permits in due time. Unfortunately, local authorities lack experience in a project of this scale and possess no foreign language skills, which further complicated the tasks." The experience and planning skills of the BATI Group project team played an important role in the coordination with partners, local authorities and suppliers and ensured the avoidance of damages, bureaucratic penalties, personal injuries or delays. The objective of the TANAP Project is to move Azerbaijani gas through the Turkish Republic to Southeast Europe in order to procure the natural gas demands of both markets and the construction of the land and sea pipes to be used through the Dardanelles Strait takes place in Biga, Turkey. The total length of the pipeline construction is 1,850km and more than 3 trillion metric cubes of natural gas will be moved through it.